"The paradox is that there is greater public interest than ever in environmentally friendly coffee, but where coffee production is expanding across the globe, it tends to be very intensive," says Shalene Jha, assistant professor in The University of Texas at Austin's College of Natural Sciences and lead author of the study published April 16 in the journal Bioscience. This is a farmer picking shade grown coffee in Honduras near the town of Trinidad. Credit: Robert Rice. 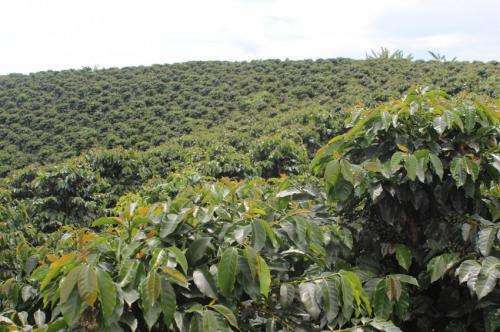 Jha and colleagues say the shifting trends toward Asia and a more intensive style of farming are driven by a dramatic drop in global coffee prices in recent years. To remain profitable, some growers have moved, seeking lower land and labor costs and higher short-term yields. 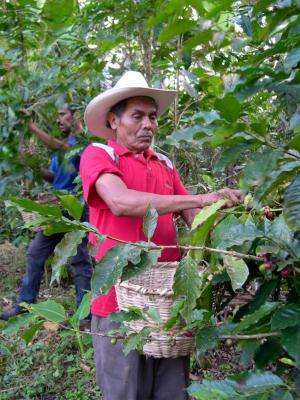 Farmers doing intensive coffee farming also earn lower prices for their product. More information: "Shade Coffee: Update on a Disappearing Refuge for Biodiversity," Bioscience, 2014. 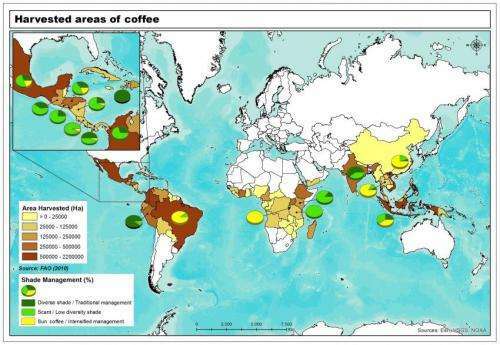 How climate-friendly is your cup of coffee?